Aviation Updates Philippines - The Dubai-based carrier, Emirates, is introducing a one-time Airbus A380 flight to Manila for the first-time to celebrate the airline's move to the International Terminal. Emirates started flying between Manila and Dubai in 1990 due to the strong passenger and cargo demand. The Airbus A380-800, which will be flown by Captain Franklyn Mallari Desiderio from the Philippines, will be utilized on the Dubai to Manila route on October 7, as one of its Emirates' three daily flights. However, the flight arrives on nighttime. Emirates Flight EK334 will depart Dubai International Airport at 9:20 AM and arrive in Manila at 10:10 PM. The return flight, which is EK8335, will then leave the Ninoy Aquino International Airport at 1:15 AM on October 8, arriving back in Dubai at 5:40 AM. "We are thankful to the Government of Philippines for allowing us to operate three daily flights in to Manila. The Philippines is one of our major markets and we have seen the demand for our services continuing to grow. Since we connected the two cities 24 years ago, Emirates served over 6.6 million passengers and carried over 150,000 tonnes of cargo. Each of our flights over those years have contributed the growth and development of Philippines' trade and tourism as well as providing ease of travel for overseas Filipino professionals," Barry Brown, Emirates’ Divisional Senior Vice President, Commercial Operations East said. "In 2013 Emirates welcomed over 820,000 passengers on its three daily Dubai-Manila services with a very high average seat factor demonstrating the consistent strength of passenger demand, choice and award-winning service which Emirates brings to Philippines," Mr Brown added. 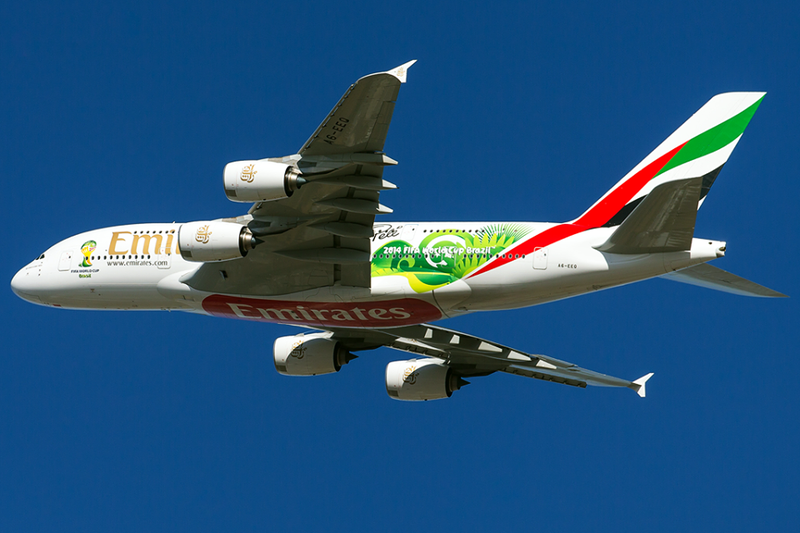 However, Emirates' Airbus A380 flight on October 7 is not the first time the A380 landed. Back then, the Airbus A380 flew to Manila in 2007, using the Airbus livery. Regular customers of the Lufthansa Technik Philippines fly to Manila with their A380 for the maintenance. NAIA's runway 06 and 24 can accommodate large aircraft such as the Airbus A380. However, can the airport handle approximately 500 passengers of the A380? Most of the foreign airports has specialized aerobridges for the A380. The Ninoy Aquino International Airport, for airlines to operate regular A380 flights, should be expanded.